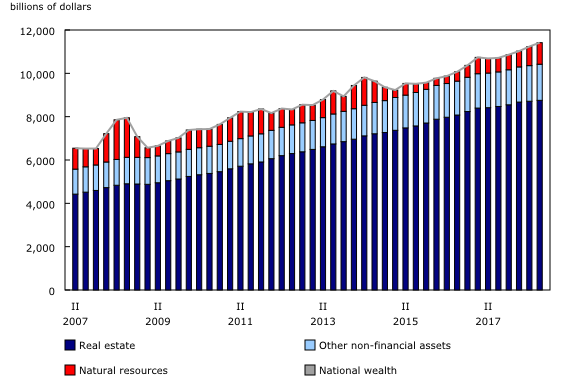 National wealth, the value of non-financial assets in the Canadian economy, rose 1.6% to $11,415.3 billion at the end of the third quarter, a deceleration from the 1.9% increase in the second quarter. Growth in the third quarter was led primarily by an increase in the value of natural resources. On a per capita basis, national wealth reached $306,584. National net worth, the sum of national wealth and Canada's net foreign asset position, increased 2.5% to $12,063.2 billion at the end of the third quarter. Net worth grew at a faster pace than national wealth due to an increase in the net foreign asset position. Canada's net foreign asset position rose by $116.1 billion to $647.9 billion in the third quarter. This mainly reflected the stronger performance of foreign stock markets relative to the Canadian market. Appreciation of the Canadian dollar against all major foreign currencies moderated the third quarter growth. Net worth of the household sector edged up 0.4% in the third quarter to $11,110.2 billion. Overall, the debt-to-asset ratio was 16.7% as growth in assets continued to outpace growth in liabilities. The value of non-financial assets remained relatively flat at $6,274.0 billion in the third quarter. The value of residential real estate declined by $19.5 billion as real estate prices declined in the quarter. This decrease was partially offset by increases in the value of consumer durables (+$9.1 billion) and inventories (+$6.6 billion). 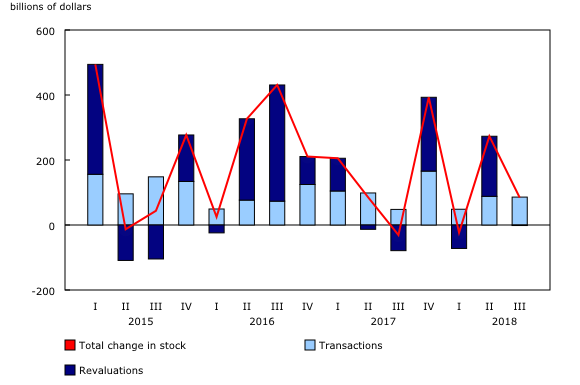 Financial assets rose 0.9% in the third quarter, led by increases in the value of equity and investment funds (+$33.2 billion). Strong foreign equity markets contributed to the gains. On a seasonally adjusted basis, total credit market borrowing slowed for the third consecutive quarter, as households borrowed $18.3 billion, down from $20.0 billion in the previous quarter. Mortgage loans decreased $1.2 billion, a third consecutive quarterly decline. In the first three quarters of 2018, household demand for mortgage loans was 43.2% lower than in the first three quarters of 2017. Demand for consumer credit (-$0.5 billion) and non-mortgage loans (-$0.1 billion) also decreased in the third quarter. Credit market debt (consumer credit, and mortgage and non-mortgage loans) totalled $2,185.3 billion in the third quarter. Mortgage debt reached $1,424.0 billion, consumer credit stood at $648.6 billion, while other loans were $112.7 billion. 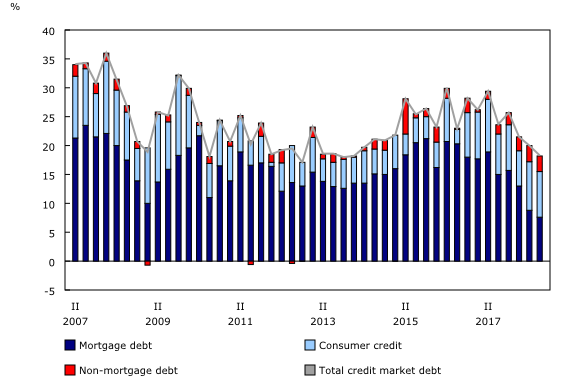 The household debt service ratio, measured as total obligated payments of principal and interest as a proportion of household disposable income for mortgage and non-mortgage debt, reached 14.5% in the third quarter, relatively unchanged from the previous quarter. 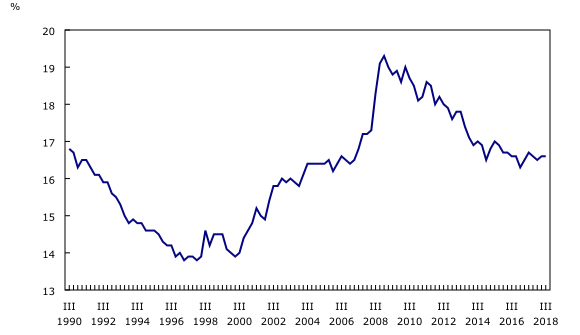 Meanwhile, interest payments on mortgage debt continued to outpace principal payments. Household credit market debt as a proportion of household disposable income was 177.5% in the third quarter, relatively unchanged from 177.4% in the second quarter. In other words, there was $1.78 in credit market debt for every dollar of household disposable income in the third quarter. On an unadjusted basis, household credit market debt as a proportion of household disposable income (excluding pension entitlements) increased to 173.8% in the third quarter from 173.2% in the second quarter (revised from 169.1%; see note to readers). The federal government demand for credit market debt was $5.3 billion in the third quarter. This was led by $9.1 billion of net issuances of short-term paper, which more than offset $3.4 billion of net retirements of bonds. This marks the third consecutive quarter of net sales and redemptions of federal government bonds by non-residents. The demand for funds by other levels of government was $3.8 billion, the majority of which was in the form of net issuances of bonds and debentures (+$4.2 billion). Domestic corporations continued to invest in provincial and local government debt through bonds and debentures. The ratio of federal government net debt (book value) to gross domestic product (GDP) improved from 27.6% in the second quarter to 27.3% in the third quarter. The ratio of other government net debt (book value) to GDP was 27.1% in the third quarter. The demand for funds by non-financial private corporations was $29.3 billion in the third quarter, down from $41.3 billion in the previous quarter. Chartered banks provided $16.3 billion in the form of non-mortgage loans in the third quarter, the second consecutive quarter where non-financial private corporations relied on non-mortgage loans to finance their operating activities. For the first time since the first quarter of 2016, non-financial private corporations recorded net retirements of bonds and debentures (-$3.6 billion). Non-financial private corporations' debt-to-equity ratio (book value) edged up in the third quarter to 71.5, the sixth consecutive quarterly increase. On a year-over-year basis, non-financial private corporations' debt-to-equity ratio increased by 4.5 points. The financial sector injected $40.9 billion of funds into the economy through financial market instruments in the third quarter, down from $73.0 billion in the second quarter. Third quarter financing was mostly attributable to non-mortgage (+$26.0 billion) and mortgage (+$14.5 billion) loans. The value of financial assets of financial corporations increased 0.6% by the end of the third quarter to $14,216.0 billion. This was attributable to net financial transactions of $85.9 billion, led by equity and investment fund shares and loans. In the previous quarter, revaluations and other volume changes of $184.8 billion in equity investment contributed to the higher value of financial assets. 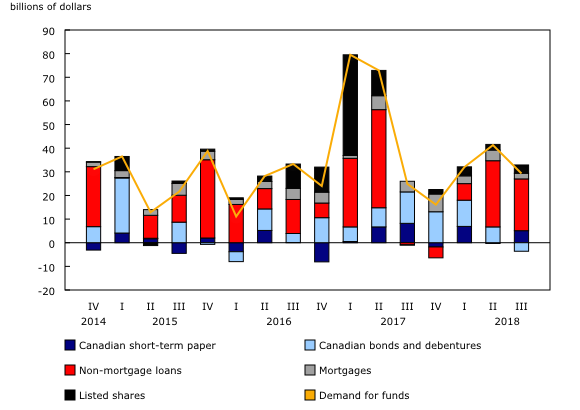 With this release of the National Balance Sheet Accounts, Statistics Canada is including a set of provisional estimates of lending and borrowing by select non-bank financial intermediaries. These entities engage in lending and borrowing activities that are outside the traditional, regulated financial system. In other words, they may not be subject to the same rules and regulations that must be adhered to by regulated financial institutions. As such, non-bank financial intermediaries can offer different terms and conditions to potential borrowers. Non-bank financial intermediaries are becoming an increasingly important source of financing for Canadians. While these selected non-bank financial intermediaries account for a small share of total lending, their overall growth from 2007 to 2017 has outpaced that of traditional lending sectors. Please see An economic account for non-bank financial intermediation as an extension of the National Balance Sheet Accounts for more details. This release of the financial and wealth accounts is comprised of the national balance sheet accounts (NBSA), financial flow accounts (FFA) and other changes in assets accounts. The NBSA are composed of the balance sheets of all sectors and subsectors of the economy. The main sectors are households, non-profit institutions serving households, financial corporations, non-financial corporations, government, and non-residents. The NBSA cover all national non-financial assets and financial asset-liability claims outstanding in all sectors. To improve the interpretability of the estimates of the financial flows, selected household borrowing series are available on a seasonally adjusted basis (table 38-10-0238-01). All other data are unadjusted for seasonal variation. For information on seasonal adjustment, see Seasonally adjusted data – Frequently asked questions. The FFA articulate net lending or borrowing activity by sector by measuring financial transactions in the economy. The FFA arrive at a measure of net financial investment, which is the difference between transactions in financial assets and liabilities (for example, net purchases of securities less net issuances of securities). The FFA also provide the link between financial and non-financial activity in the economy, which ties estimates of saving and non-financial capital acquisition (for example, investment in new housing) to the underlying financial transactions. While the financial flow accounts record changes in financial assets and liabilities between opening and closing balance sheets that are associated with transactions during the accounting period, the value of assets and liabilities held by an institutional unit can also change for other reasons. These other types of changes, referred to as other economic flows, are recorded in the other changes in assets account. There are two main components to this account. One is the other changes in the volume of assets account. This account includes changes in non-financial and financial assets and liabilities relating to the economic appearance and disappearance of assets, the effects of external events such as wars or catastrophes on the value of assets, and changes in the classification and structure of assets. The other main component is the revaluation account, showing holding gains or losses accruing to the owners of non-financial and financial assets and liabilities during the accounting period as a result of changes in market price valuations. At present, only the aggregate other change in assets is available within the Canadian System of Macroeconomic Accounts; no details are available on the different components. Definitions concerning financial indicators can be found in Financial indicators from the National Balance Sheet Accounts and in the System of macroeconomic accounts glossary. The ratio of credit market debt to disposable income, both seasonally adjusted and unadjusted, was impacted by a downward revision to household disposable income in 2016. This revision was due to the incorporation of information received from the latest T4 tax filings. It resulted in an upward revision to the ratio. This third quarter release of the national balance sheet and financial flow accounts includes revised estimates from the first quarter of 1990 to the second quarter of 2018. These data incorporate new and revised data, as well as updated data on seasonal trends. In the near future, data enhancements to the national balance sheet and financial flow accounts will be incorporated, such as the development of detailed counterparty information by sector. In order to facilitate this initiative and others, it is necessary to extend the annual revision period (normally the previous three years) at the time of the third quarter release. As such, for the next two years, with the third quarter release of the Financial and Wealth Accounts, estimates will be revised back to 1990 to ensure a continuous time series. The Bank of Canada and Statistics Canada conducted a joint study to understand and identify key differences between their respective measures of business credit loans, including non-mortgage business loans, non-residential mortgages and commercial paper. Results of the joint study can be found in the link in the "Products" section. With this release, seasonally adjusted stocks of household credit market debt in addition to seasonally adjusted financial flows are now published in the quarterly release of the Financial and Wealth Accounts in table 38-10-0238-01. With this release, we are introducing new estimates of seasonally adjusted credit market debt to personal disposable income. Please see Seasonal adjustment of stocks and flows in the Financial and Wealth Accounts: towards an integrated approach for more information on the data sources and methodologies. The document "Understanding business credit measures: a joint study by the Bank of Canada and Statistics Canada," which is part of Latest Developments in the Canadian Economic Accounts (Catalogue number13-605-X), is now available. The document "Seasonal adjustment of stocks and flows in the Financial and Wealth Accounts: towards an integrated approach," which is part of Latest Developments in the Canadian Economic Accounts (Catalogue number13-605-X), is now available. The document "An economic account for non-bank financial intermediation as an extension of the National Balance Sheet Accounts," which is part of Latest Developments in the Canadian Economic Accounts (Catalogue number13-605-X), is now available.